Girls love to play house. 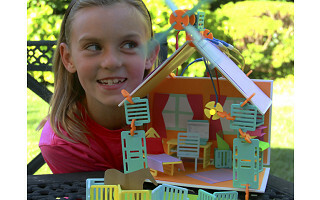 Now they can design their very own play homes with Roominate, a building toy that encourages creativity, inspires imagination, and introduces girls to the basic principles of engineering in a fun, age-appropriate way. Each Roominate Kit comes with all the parts neccessary (including a battery pack, circuits, and simple step-by-step instructions) to wire rooms with working lights, a fan, or motorized pulley. 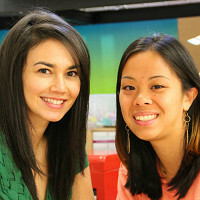 While earning master’s degrees in engineering, Alice Brooks and Bettina Chen came up with the idea for Roominate as a way to pique interest among girls in what are known as the STEM fields of Science, Technology, Engineering, and Mathematics. 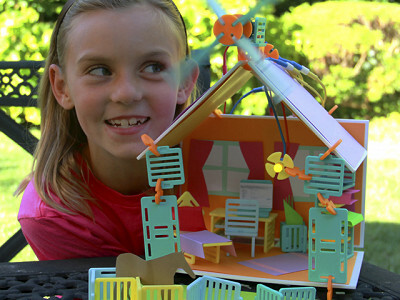 Designed for ages 8 to 12, this building kit enhances imaginative play while promoting hands-on problem solving skills and spacial awareness. Follow a pattern or create her own designs. There’s no limit to what girls can do with Roominate. My daughters, ages 8 and 10, tested it out and had a great time building their dream bedrooms; they never would have guessed that they were learning some valuable life lessons along the way.